Martha Trump a special investigating agent of crime branch was looking at her case files with pride. Whether it was an enigmatic robbery or a gruesome murder nothing remained unsolved in her career spanning ten years. 'It feels good to have 100% record in crime solving, err... actually 99%,' she said dejectedly seeing the last page which has details of red lipstick serial killer. 'She has killed twenty five men without any evidence and clue, brilliant,' she smiled cunningly. 'But these men irritate too much,' she applied red lipstick to lure her twenty sixth prey. 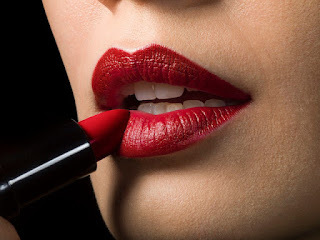 This post is linked to Five Sentence Fiction(lipstick) and Three Word Wednesday #440 (enigmatic,gruesome,irritate). love your twist in the story. I'd love to hear more of this story. Yes, it could only be her having learned the best"modus operandi"! Wow, that was amazing...a brilliant take on the prompt, loved the twist in the end!! Liked the idea. could be developed into an interesting plot. Bravo!!! loved this punch at the end and very clever response to two prompts!! Red lipstick as lure, interesting! It may cause a lot of heart-ache! Gujarat Model - A Myth. Uphar Tragedy - Where Is The Justice?